The new release of DB Optimizer , version 3.o, from Embarcadero has awesome new feature : explain plan overlay onto VST diagrams! The red lines with crows feet mean that as far as the definitions go, the relations could be many to many. There is one filter in the diagram, represented by the green F on table B. Table B has a filter criteria in the query “b.val2=100″. Ok, table B is where we start the query. Now where do we go from B? Who is the parent and who is the child? It’s not defined in the constraints nor indexes on these tables so it’s hard for us to know. Guess what ? It’s also hard for Oracle to figure it out. Well, what does Oracle decide to do? This is where the cool part of DB Optimizer 3.o comes in. For the digram we can see Oracle starts with B and joins to A. The result if this is joined to C. Is this the optimal path? I plan to blog more about this awesome feature. It’s really cool. 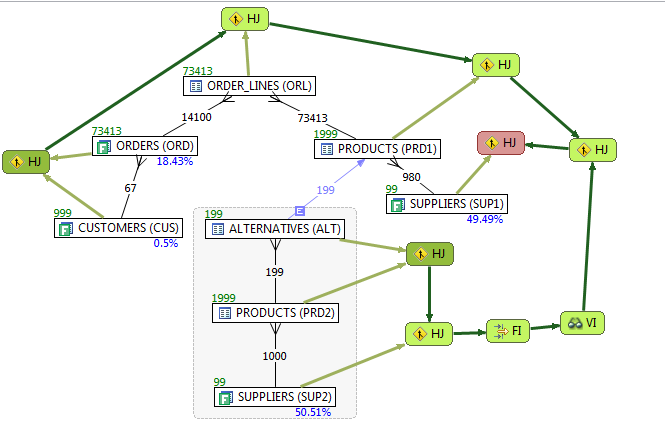 Now that we can determine a candidate for best optimization path, does Oracle take it? Can you find the optimization error? Dark green is where execution starts. There are two starts: one for the main query body and one for the subquery. The red is where query execution ends. PS a big part of this work is by the lead developer Matt Vegh. Many thanks to Matt for this awesome work. 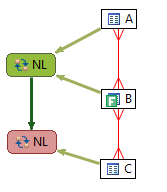 The dark green nodes are starts, so there are 4 separate starts. We can see how the result sets from each start are joined with each successive table join set. The red is the final step. SQL tuning can be a challenge to even the most experienced database professional. So, how can you give yourself a leg up in optimizing a difficult query? 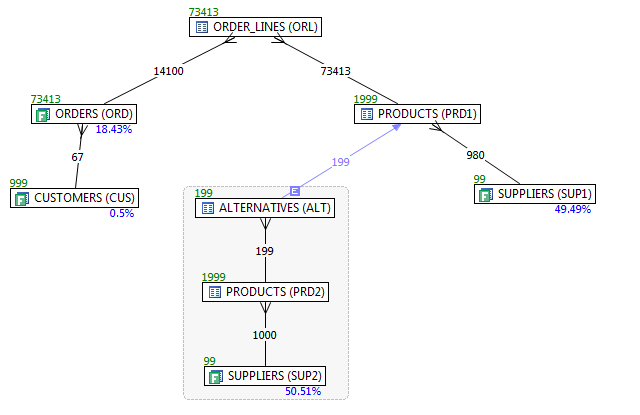 As you will discover in this best practice, visualizing the query can help you quickly understand the query, as well as define its optimal execution path. A best practice for visualizing the query is to draw the query out as a Visual SQL Tuning (VST) diagram. Not exactly user-friendly. I think I might need a couple of double espressos before I plunge into this one. If I was greeted with this first thing in the morning, I’d definitely get a coffee before attempting to operate on it. The explain plan is just a set of directions that the database takes to retrieve the data from the database in order to satisfy an SQL query. An analogy would be if we imagine the SQL query as a google maps request for directions to get from my home in the suburbs to my office downtown. The explain plan is like the turn-by-turn route list. But for any of us who have gotten lost well know, it’s also nice to be able to see the map as well as the turn-by-turn directions. 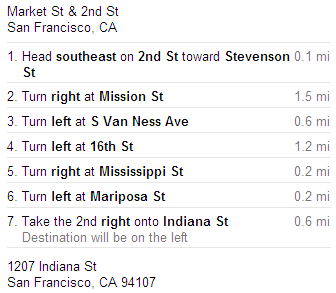 If google maps only gave me the directions without the map I’d be pretty upset, probably lost and totally anxious about how long it’s going to take me to get to my destination. 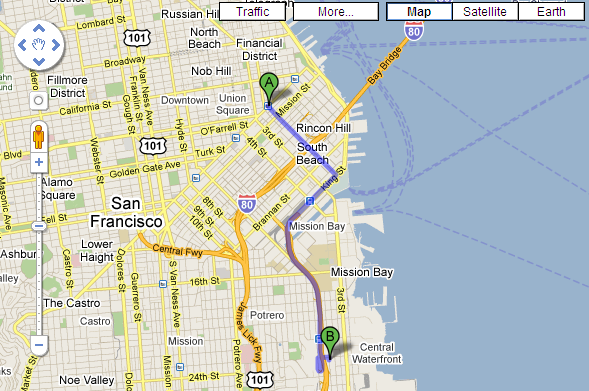 On the map, the directions look pretty sensible, but what if there was a traffic jam on some streets and not others? How about a map that included traffic jams (i.e. bottlenecks)? Now we have a map of the terrain. Seeing the terrain allows us to pick out an optimal explain plan. To pick an optimal explain plan, find tables that have the most selective filter and start the execution there. In the above case there is only one table with a filter. This filter is denoted by the F icon on the table BROKER. Start at BROKER and then look for joins that keep the running row set size to a minimum. 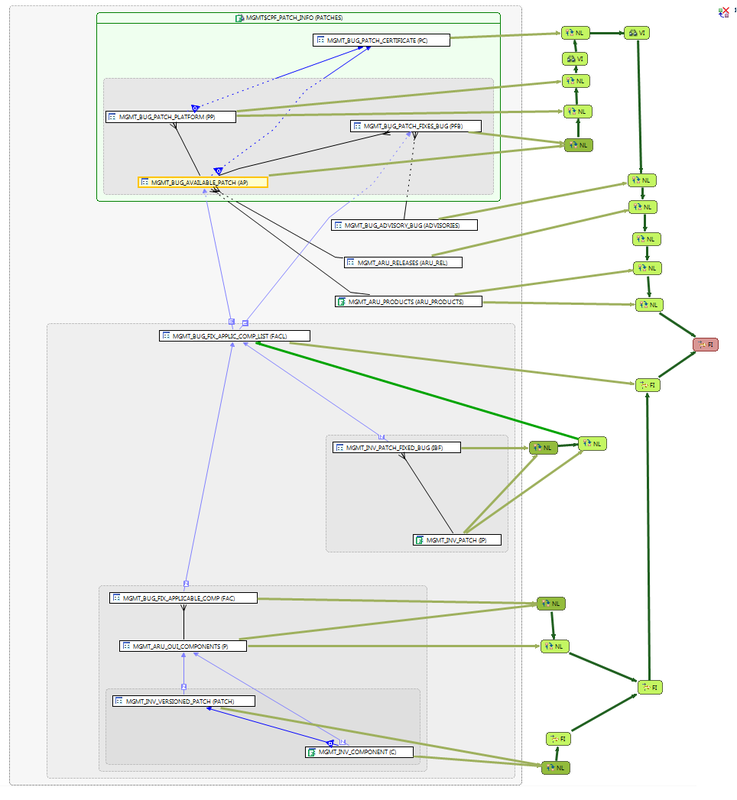 The running row set size is the number of rows we carry from the previous node to the next node in the VST. We have to visit all the nodes, but the fewer rows we have to carry with us from one node to the next, the faster we’re going to arrive at our destination. Thus, the idea is to start at the most selective filter and join down before joining up. 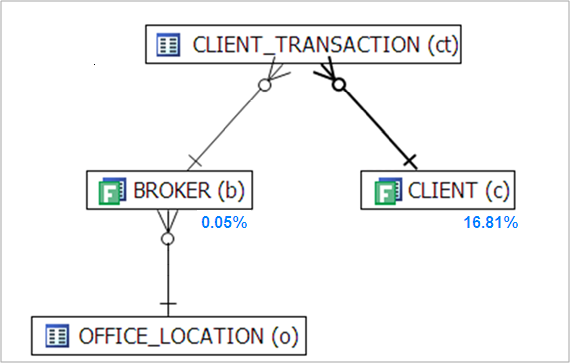 In our example there is only one filter on BROKER, so we start there, we join down to OFFICE_LOCATION, then finish off with CLIENT_TRANSACTION, and end at CLIENT. But what if we have more than one filter and we have to choose? In that case we have to calculate the filter percentage. The filter percentage is simply the number of filter rows divided by total rows in the table. Filter rows are the number of rows returned after applying the filter criteria on that table from the query. To navigate the VST above, we again start at BROKER with the most selective filter, then look for the smallest two table join size which is OFFICE_LOCATION with a join size of 3. Then we join to CLIENT_TRANSACTION and finally CLIENT. 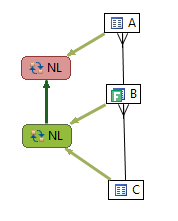 As you can see, VST diagrams act like the map for the terrain that an SQL query has to navigate. When a simple map is not enough, we can add statistics such as filter percentages and two table join sizes to complete the map. 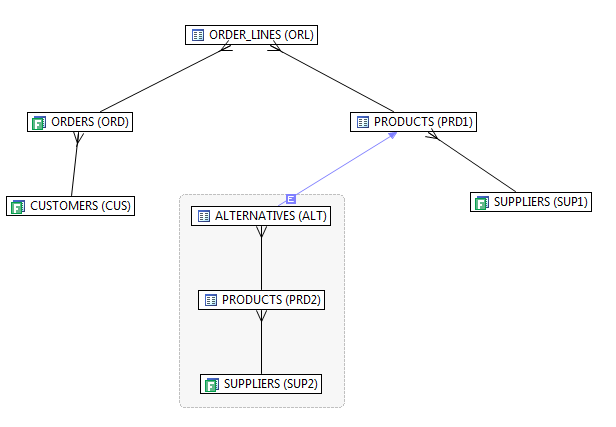 VST diagrams can be drawn on paper, with tools such as Visio or with database products that draw them automatically using the SQL query, schema definitions and table statistics.